Should Media Companies Fear Facebook Live and Instant Articles or Embrace Them? Of the many talking points Tuesday at Facebook's F8 conference, two stood out because of their potential ramifications: the full rollout of Instant Articles and Facebook Live opening up to developers. The program lets publishers post whole text stories and other multimedia content directly to the news feed while selling ads against them, though it threatens to siphon traffic from their proprietary websites. Is Facebook, with the initiative, being a friend to publishers or a foe? "Facebook Instant Articles is neither an ally nor a threat since the war is already over, and Facebook won," said Sean Cullen, evp product and technology at Fluent. "Publishers have no choice but to adopt Instant Articles in order to maintain their existing traffic levels and many will have no choice but to buy advertising from Facebook to grow." Yaniv Makover, CEO of content marketing vendor Keywee, said, "Facebook is a long-term gain for publishers that provide long-term value. However, publishers looking for a quick fix will be discouraged. Some publishers might think Facebook has overly onerous user-experience guidelines that favor quality content over content whose chief purpose is to go viral." There are, of course, other viable platforms for publishers to push their content including Twitter, Snapchat, Google AMP and Apple News, noted Gil Regev, CMO of tech vendor Marfeel. "One thing publishers do need to keep in mind is that Facebook is just one channel," he said. "They should not pick and choose between these but rather utilize them all. [It's important to stress] the need to continue grooming their own mobile properties, making sure that they provide attractive, interactive, cohesive, engagement and monetization-driven layouts that act as landing pages, keeping users engaged and coming back for more." John Potter, CTO of Purch, views Facebook as more of an ally than a threat for publishers. "On the other hand," he said, "Facebook could become a threat in the future if publishers become too reliant on the platform to reach an audience, which is no different than the current situation with Google." Potter also said, "Given the growth of other social platforms such as Snapchat and Twitter, you can plausibly make the argument that Facebook will never be as dominant as Google has been on the web." This is a program that could challenge online video companies as well as TV players because Facebook aims to change the way people consume live content. The new API—with developers creating possibly intriguing products for content creators to leverage—should bolster the platform. To a person, Facebook Live seems like a classic, wait-and-see initiative because livestreaming as a whole is still in its infancy. For instance, Periscope has only been around for 15 months, and plenty of attempts in the space have either changed course—e.g., Meerkat—or fallen by the wayside entirely. So, opinions are mixed on whether the new social video hub can be truly game changing and hurt TV or entrenched video names like YouTube. "Facebook isn't the first web platform to attempt a disruption of the live broadcast ecosystem, but they might be the first with a scale that can outpace television and provide a bigger audience opportunity than the cable networks that broadcasters currently build on," said Christian Brucculeri, CEO of social marketing company Snaps. "Right now, we are seeing product executions in Facebook that don't compete with traditional live broadcast content, and they don't seem to be aiming the product at tune-in experiences." But, Brucculeri added, "once we see a few events outpace television in terms of tune in, the monetization opportunities could start to open up in big ways." And that could draw dollars away from cable/TV players and online video. In fact, Brandon Gabriel, president of agency Midnight Oil, suggested the livestreaming hub will lure marketers. "We believe that by pairing Live video with Facebook's user base, we can encourage brands to transition away from less personal content to more authentic content," Gabriel said. 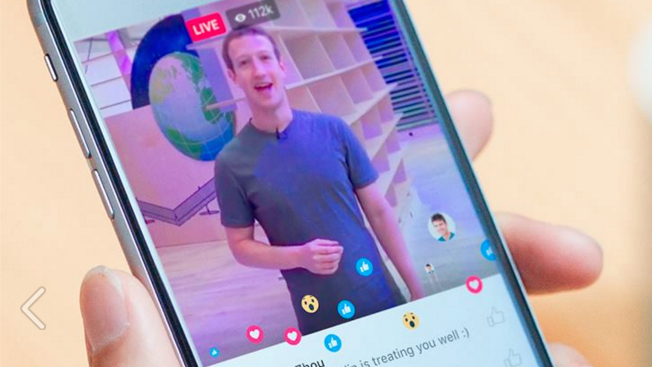 One thing is for certain: The whole marketing industry will be watching closely to see if Facebook Live gains serious traction.